Μετά την Ιαπωνική έκδοση, η Toyota παρουσίασε και την Ευρωπαϊκή-Αμερικάνικη έκδοση του ανανεωμένου Land Cruiser. Το ανανεωμένο μεγάλο SUV των Ιαπώνων διαθέτει νέο προφυλακτήρα, νέα γρίλια, νέους προβολείς ομίχλης, επανασχεδιασμένα φωτιστικά σώματα με LED φώτα ημέρας, νέους καθρέπτες, ζάντες από 18″ έως 20″ καθώς και νέα πίσω φωτιστικά σώματα. Στο εσωτερικό οι αλλαγές είναι περιορισμένες και εντοπίζονται στον νέο πίνακα οργάνων, στα περισσότερα μεταλλικά διακοσμητικά και στο νέο τιμόνι με τα ξύλινα διακοσμητικά, στα διάτρητα δερμάτινα καθίσματα, στον αισθητήρα βροχής στο παρμπρίζ, στο νέο σύστημα ενημέρωσης και ψυχαγωγίας με GPS και 14 ηχεία JBL. Μηχανικά φορά τον 5.7-λίτρων V8 κινητήρα απόδοσης 386 άλογα με 543 Nm ροπής. Συνδυάζεται με ένα 6-τάχυτο αυτόματο κιβώτιο. Για να βελτιώσει τις εκτός δρόμου δυνατότητες του αυτοκινήτου, η Toyota πρόσθεσε το σύστημα Multi-Terrain Select το οποίο ρυθμίζει αυτόματα το ποσοστό μπλοκαρίσματος των τροχών. Περισσότερες λεπτομέρειες μπορείς να βρεις στο δελτίο τύπου που ακολουθεί. The legendary Toyota Land Cruiser recently celebrated its 60th anniversary since its original launch in Japan and has remained constant in Toyota’s U.S. model lineup for more than 50 years. 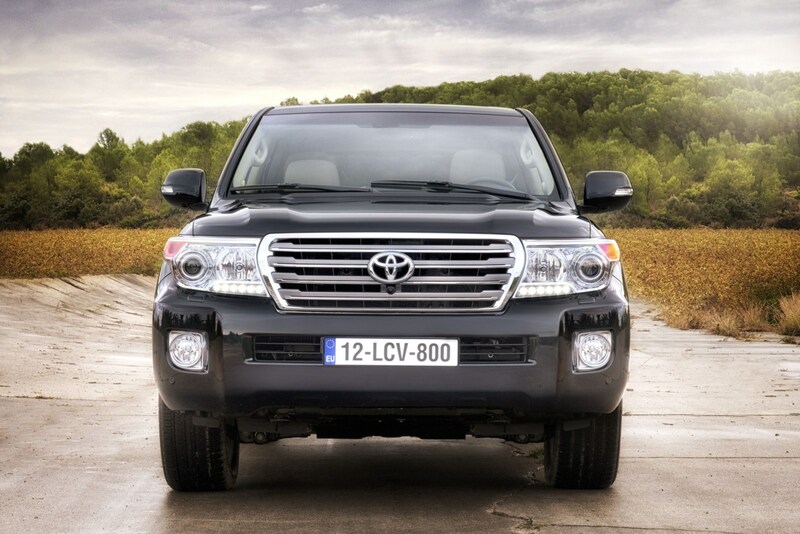 Land Cruiser has evolved over time from a basic four-wheel-drive utility vehicle in its early years to an upscale eight-passenger sport utility vehicle (SUV) sold in 188 countries. Yet, this iconic vehicle has retained a loyal following as it remains true to its off-road heritage with uncompromising go-anywhere capability. 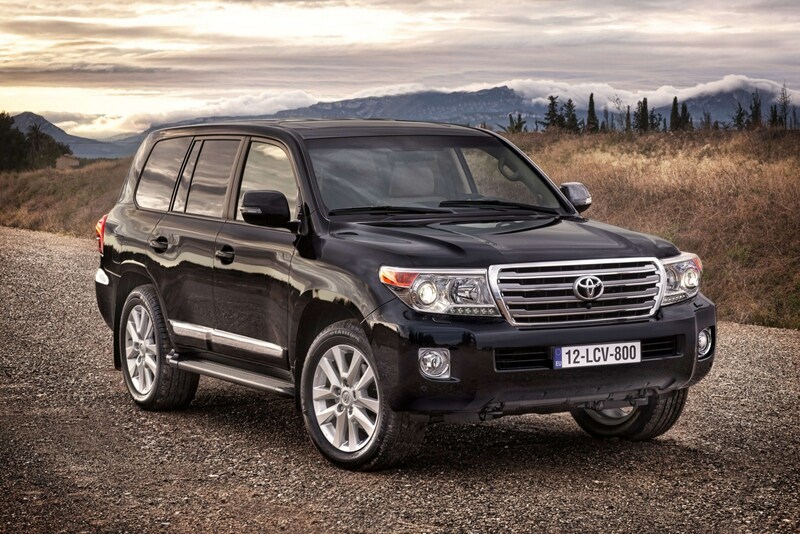 For the 2013 model year, Land Cruiser receives exterior and interior styling enhancements. 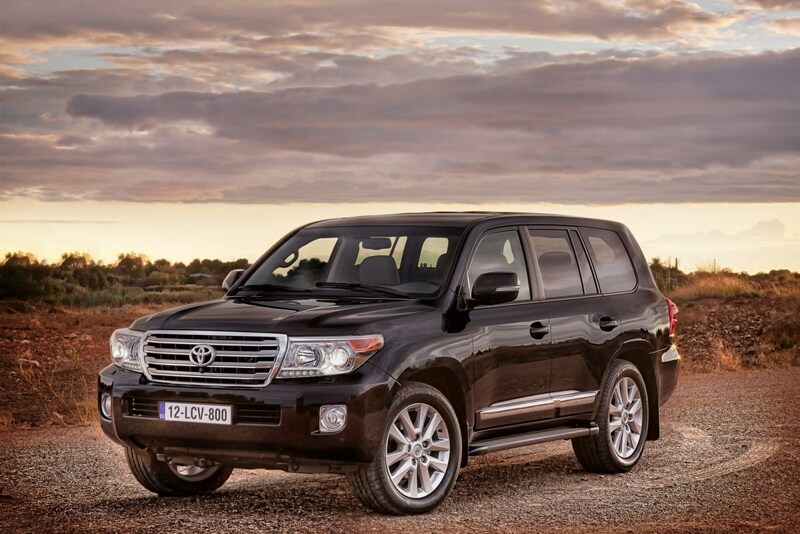 Additionally, Land Cruiser will now come with all features as standard equipment, including new driving performance features, and an array of significant safety and convenience features. Among the many popular features that were formerly available as options, but are now standard, are rear-seat DVD entertainment system, color-keyed rear spoiler, rain-sensing windshield wipers, center-console cooler box, headlamp cleaners, leather-trimmed steering wheel, multi-information display, voice and Bluetooth® hands-free controls, leather-trimmed shift lever and heated second row seats. 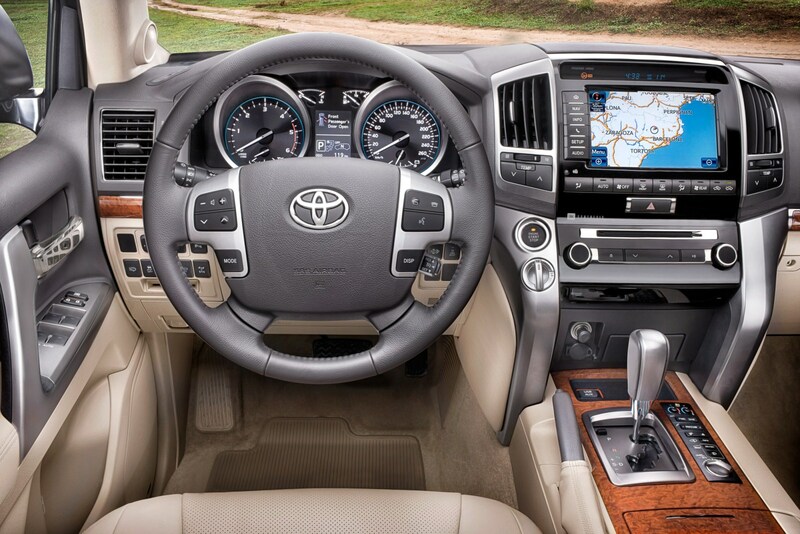 Toyota’s Premium Hard Disk Drive (HDD) Navigation with Entune multi-media system and JBL® audio is also standard. 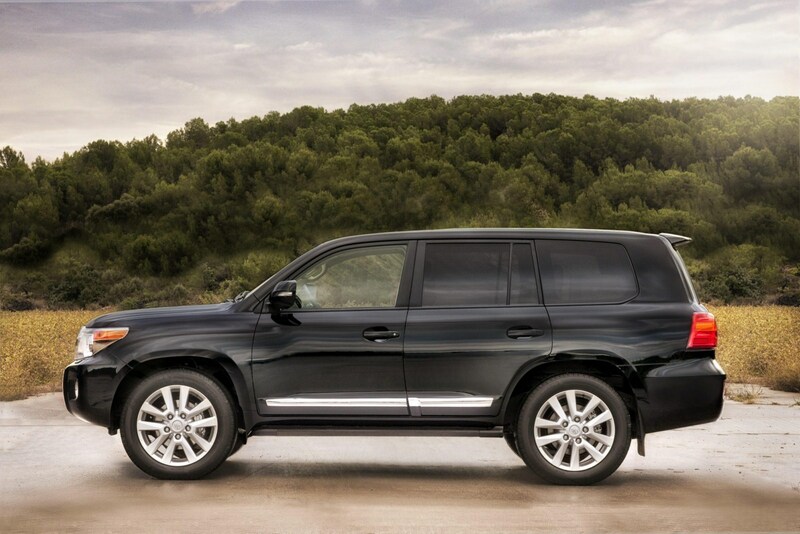 Exterior Design The 2013 Land Cruiser receives refreshed exterior styling that includes an updated front grille and headlamps with HID low-beams. Additional new features include LED Daytime Running Lights, chrome side molding, redesigned outer side mirrors and tail lamps. The design continues to convey an “Advanced and Rugged” theme with enlarged front and rear fenders. The new grille and headlamps maintain Land Cruiser’s steady and confident appearance, while the hood flows gracefully into the grille and beltlines. Character lines in the front, the area around the rear door handles, and the back door panels suggest strength. Foam-filled A-pillars and a “bifacial” molding between the windshield and the body both help reduce wind noise. 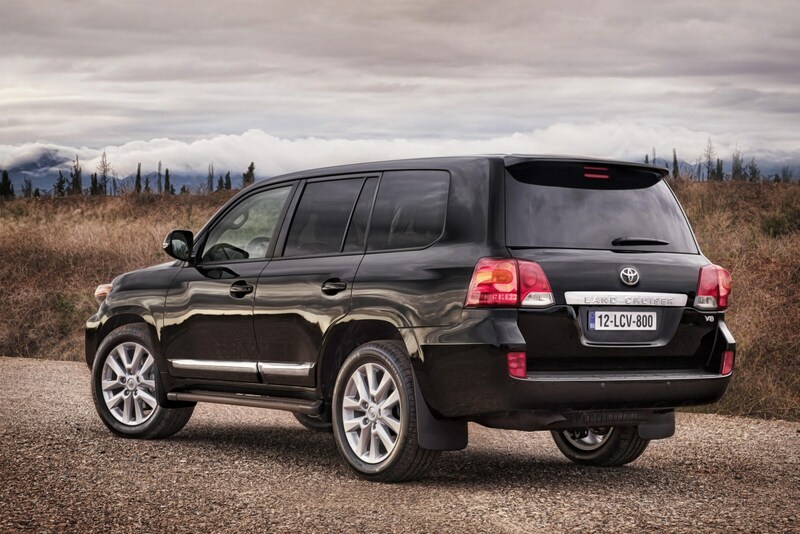 Land Cruiser is available in seven exterior colors, including Pearl White, which is new to the palette. Additional colors include Classic Silver Metallic, Magnetic Gray Metallic, Salsa Red Pearl, Sonora Gold Pearl, Amazon Green Metallic and Black. Interior Design Complementing the freshened exterior, Land Cruiser receives an updated interior available in either Sandstone or Black. Additional refinements include perforated leather trim with ventilated front seats, a higher gloss wood grain finish, brighter silver instrument panel ornamentation, chrome-plated air registers and updated meter-cluster lighting. New interior convenience features include a Multi-terrain Monitor with front, side or rear selectable views; a new Multi-information Display; an Eco Driving Indicator light and zone display; a heated steering wheel; Dynamic Radar Cruise Control; an additional power outlet (DC 12V) at the rear of the center console; and a rear cargo deck power outlet that has been changed to AC 120V from AC 115V. 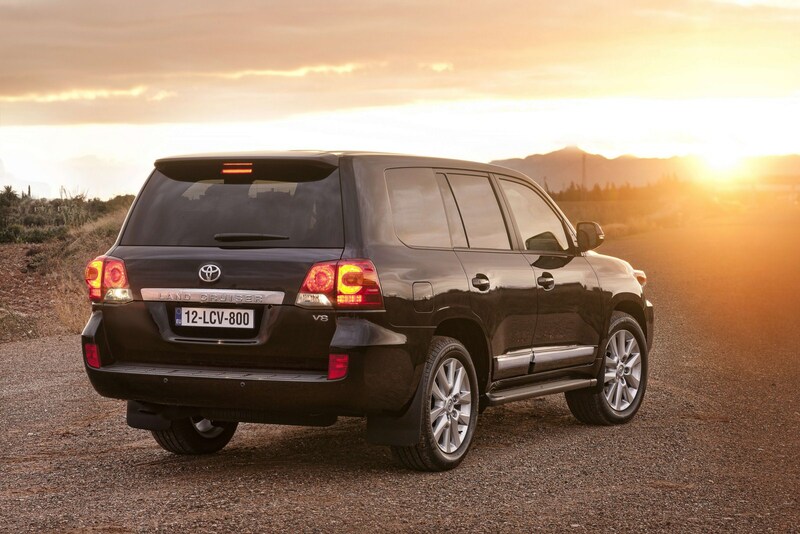 Land Cruiser seats up to eight, with three-across seating in the second and third rows. The instrument panel features a set of bright Optitron gauges with white illumination. Beneath these gauges, a multi-informational display shows gear selection, odometer, tripmeter, fuel consumption, individual tire pressures and cruising range. The vehicle’s center console features a gate-type shifter with sequential-shift-mode operation, the parking brake, center-console cooler box, USB port and cup holders. Performance The Land Cruiser’s 5.7-liter V8 DOHC engine produces 381 horsepower at 5,600 rpm and 401 lb-ft of torque at 3,600 rpm. Ninety percent of peak torque is available at just 2,200 rpm, helping make it an outstanding tow vehicle. The Land Cruiser uses regular-grade (87 AKI) gasoline and is ULEV-II certified. The V8’s advanced dual independent Variable Valve Timing with intelligence (VVT-i) system controls valve timing and overlap on both the intake and exhaust valves, which helps to optimize power, fuel efficiency and emissions. The Acoustic Control Induction System (ACIS) switches the length of the intake tract in two stages, based on RPM and throttle angle, to improve torque across the engine speed range. Stainless steel exhaust manifolds flow into a full stainless steel exhaust system. A water-cooled oil cooler helps control oil temperature while towing. The Land Cruiser’s six-speed automatic transmission is designed to handle high torque while performing with luxurious smoothness. Fourth gear is direct drive, and both fifth and sixth gears are overdrive ratios. The transmission’s control unit estimates road conditions to select the appropriate gear ratio for the vehicle’s speed and driving conditions. A sequential shift mode allows the driver to select gears manually. 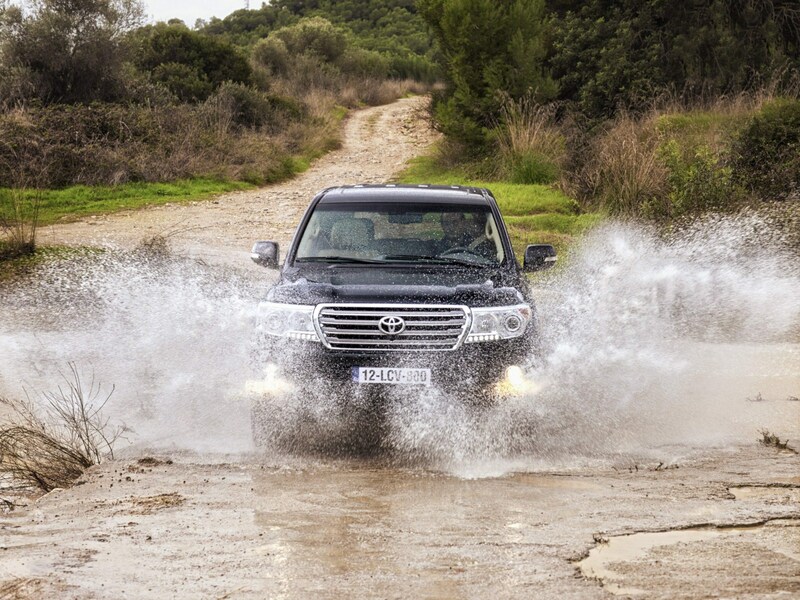 Capability, Handling and Ride The Land Cruiser’s body-on-frame construction provides rugged durability in extreme driving conditions, plus impressive towing capability and ride isolation characteristics. The front of the frame features a three-stage crush structure, so frame damage to other areas of the vehicle is minimized in the case of frontal impact. The Land Cruiser’s high-mount double-wishbone front-suspension system uses gas-pressure shock absorbers, a hollow stabilizer bar, and coil springs. This system provides a high level of off-road driving capability and suspension control while maintaining outstanding on-road driving comfort. Approach and departure angles are 30 degrees and 20 degrees, respectively. At the rear, the reliable and proven four-link, coil-spring with lateral-rod format provides a long suspension stroke and also features gas-pressure shock absorbers and a hollow stabilizer bar. 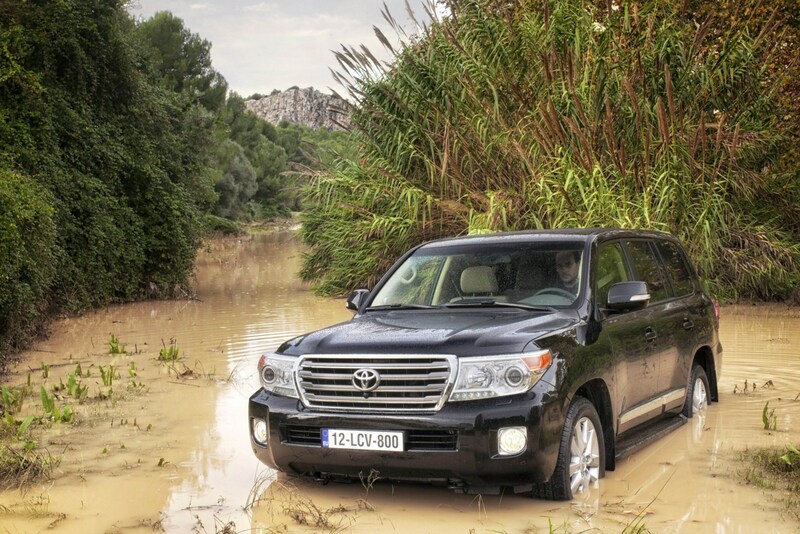 New on Land Cruiser is a Multi-terrain Select system that dials in wheel slip control to match the terrain. In loose terrain such as mud and sand, more-than-normal wheel slip is permitted, allowing wheel-spin to work in the vehicle’s favor. On bumpy moguls, or solid rock, wheel slip is minimized and the system acts more like a limited slip differential. The Mogul setting is for any extremely uneven terrain, such as V-ditches, slopes, and ridges, uphill or down. Land Cruiser rides on P285/60 R18 mud-and-snow steel-belted radial tires mounted on new 18 x 8.0-inch aluminum alloy wheels with a high-gloss finish (including a full-size spare). The brake system employs 13.4-inch ventilated discs with four-piston calipers up front and 13.6-inch ventilated discs at the rear. Variable gear ratio power-assisted rack-and-pinion steering requires just 3.1 turns lock-to-lock. Gear ratio is set larger around the steering center and smaller around the end position. Safety The Land Cruiser utilizes welded high-strength sheet steel, especially in the A-, B-, C- and D-pillars, and in the rocker area to increase rigidity and reduce weight. The B-pillars are designed to help absorb side impacts and help dissipate into the rest of the body structure. Pushing the “SOS” button can summon help in an emergency and for a wide range of roadside assistance needs. If a Land Cruiser equipped with Safety Connect is stolen, the system can help local authorities locate it. Land Cruiser features 10 standards airbags: driver and front passenger dual-stage advanced airbags; driver and front passenger knee airbags; front- and second-row seat-mounted side airbags; and three-row roll-sensing side curtain airbags with a roll-sensing cutoff switch. All eight seating positions feature three-point seatbelts. Active headrests on the driver and front passenger seats move up and forward almost instantly in the event of certain rear-end collisions to help reduce the distance between the occupant’s head and the headrest. An available advanced seatbelt system is designed to retract the front seatbelts when the brakes are suddenly applied or when tire slippage is detected by the VSC system. 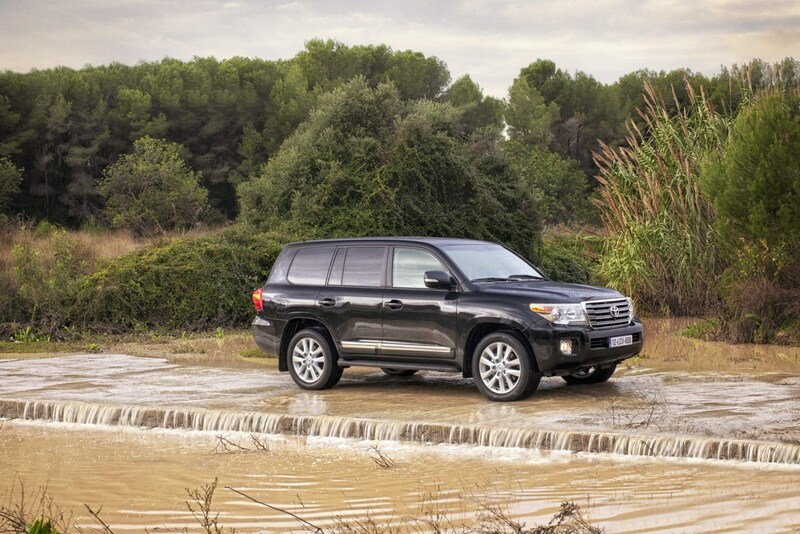 New for Land Cruiser is a Pre-Collision System designed to detect other vehicles and obstacles in its path and help optimize the restraining performance of the front passenger seatbelts if a collision is imminent. 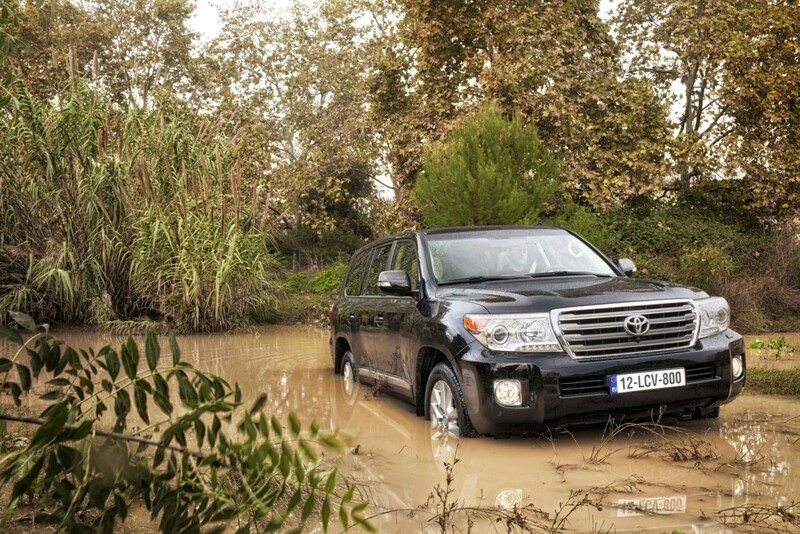 Entune™ Land Cruiser will come standard with Toyota’s new Premium HDD Navigation system with Entune™ and JBL®. The system includes an eight-inch touch/spilt-screen with an integrated backup camera display, AM/FM CD player with MP3/WMA playback capability, 14 JBL speakers including subwoofer, SiriusXM™ Satellite Radio capability (includes three-month trial subscription to XM Select Package); HD Radio™ with iTunes® Tagging, USB port with iPod® connectivity and control, vehicle information, hands-free phone capability, phone book access, advanced voice recognition, and music streaming via Bluetooth® wireless technology. Toyota’s new Entune multimedia system leverages the mobile smartphone to provide a richer in-vehicle experience with fully integrated access to navigation, entertainment and information services. Toyota Entune debuts the Land Cruiser’s first-ever support for engaging mobile apps, such as Bing, OpenTable, and movietickets.com, along with accessing useful travel-related services, such as live weather, traffic, fuel information (location and price), stocks, and sports. Entune brings one of the largest selection of music options available to a vehicle, including iHeartRadio’s 750+ stations, and Pandora’s personalized music service (access to Entune services is complimentary for three years). The audio systems combined with Entune feature an advanced conversational voice recognition system that helps the driver to stay focused on the road by eliminating the need to memorize thousands of voice commands. Comfort and Convenience With 28 total air vents, the four-zone climate control system is designed to bathe occupants in comfortable air — even during extreme heat — rather than simply projecting streams of cool air at them. For extreme cold situations, the Land Cruiser’s auxiliary Positive Temperature Coefficient (PTC) heater warms air instantly by passing it over an electrically heated ceramic element. The system also includes a micro-dust and pollen filter, and seven-level blower control. The Land Cruiser comes luxuriously equipped, with standard features that include rear privacy glass, Smart Key keyless entry with push-button start that allows the driver to unlock or start the vehicle without inserting a conventional key; anti-theft security system; engine immobilizer; cruise control; power moonroof; auto-dimming rearview and side mirrors; HomeLink® universal garage-door/gate opening system; steering wheel-mounted audio controls; heated, power front seats with driver’s memory; and power tilt and telescopic steering column with memory. Limited Warranty Toyota’s 36-month/36,000 mile basic new-vehicle warranty applies to all components other than normal wear and maintenance items. Additional 60-month warranties cover the powertrain for 60,000 miles and corrosion with no mileage limitation. Toyota dealers have complete details on the limited warranty. 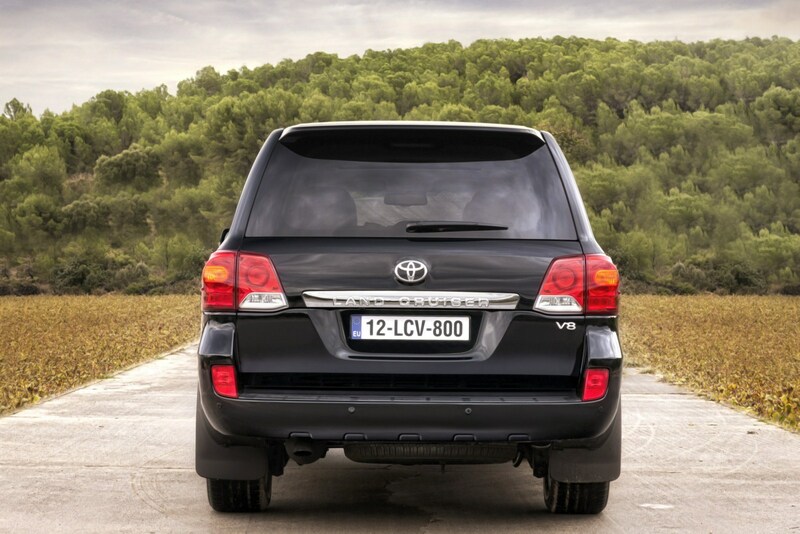 The Land Cruiser will also come standard with Toyota Care, a complimentary plan covering normal factory-scheduled maintenance and 24-hour roadside assistance for two years or 25,000 miles, whichever comes first.